Our look at the glittering details of various crown jewels continues today with a close-up view of one of the most historic crowns in Britain: the Crown of Scotland. The crown is displayed with the Honours of Scotland in the Crown Room at Edinburgh Castle. It shares a display case with three other very important Scottish objects: the Sceptre of Scotland, the Sword of State, and the Stone of Scone. That stone, also known as the "Stone of Destiny," resided in Westminster Abbey until 1996. The stone is used in the coronation of British monarchs, and it will be returned to the Abbey for the next coronation, whenever that may be. The crown and the other Honours of Scotland have been successfully hidden multiple times to prevent them from being stolen or destroyed. They have survived both Cromwell and World War II, so it should come as no surprise that they're the oldest surviving set of crown jewels in Britain. The current crown was made in 1540 for King James V of Scotland, father of Mary, Queen of Scots. Gold from a previous version of the crown was melted down and reused for the construction of this crown, and some of the gems from the earlier version were also recycled. The crown is usually displayed with a red velvet cap; its arches, which meet at a monde and cross, are more visible with the cap removed. Gemstones set in the crown include Scottish freshwater pearls, garnets, and amethysts. The Crown of Scotland is not generally worn today, but it is brought out of its display for important Scottish events, including the opening of parliament. 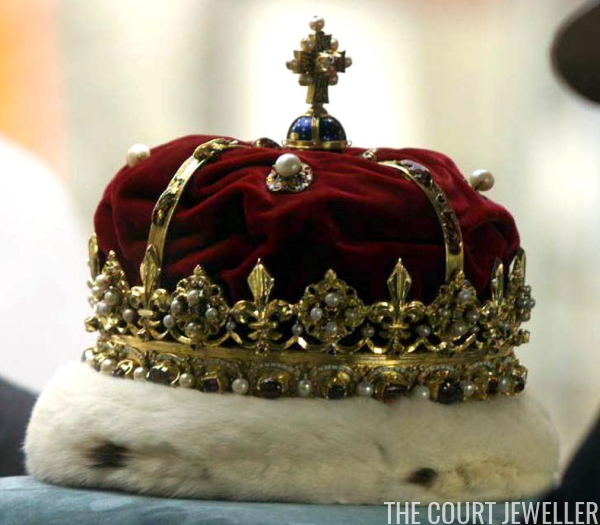 You can read much more about the crown in our recent article over here!